The quarterback position is the focus here for me. We have Peyton Manning who hasn’t been at his best since the injury and has been good, but not great to his standard. With two weeks of preparation, does the sheriff have one more last big game left in him before his supposed retirement? Cam Newton on the other side has a chance to cap his should-be-MVP season. He can run, he can throw and he’s really big and strong. His development this year has been great and even without an established receiving corp, he has made all of them better. Greg Olsen is the biggest receiving name on the Panthers and he is the most reliable option for the passing game. Expect Olsen to be a big factor in helping the Panthers set the tone. Looking at the Broncos, other than Demaryius Thomas and Emmanuel Sanders, Manning has to figure out how to get the tight ends involved. They traded for Vernon Davis yet he has not made much of an impact. Does this happen today? I actually think the running game will be the point of emphasis early on for both teams. Jonathan Stewart is going to take a lot of the load for the Panthers to get the ball rolling. Whoever takes the carries for the Broncos, whether it’s Ronnie Hillman or C.J. Anderson, it will be a huge factor. 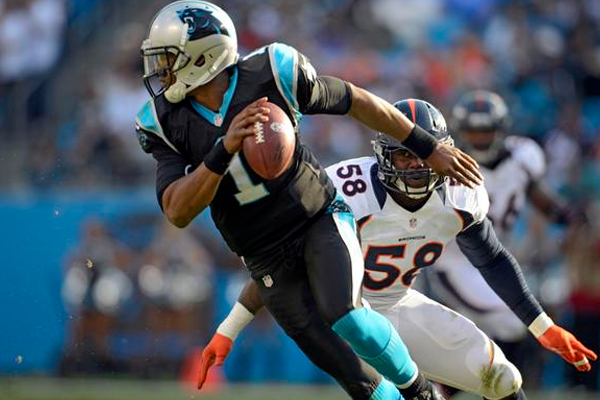 The Broncos pass rush has been phenomenal and that might neutralize a Panthers offense that has looked pretty good. I look forward to that. Both coaches are appearing in their first super bowl as the man in charge. Ron Rivera and Gary Kubiak are both very intelligent coaches and understand the chess match of this game. This will be a fun one. The special teams X-factor will most definitely play a part. Field goals, field positions are obvious. The return game will be a big focus and the teams will have to be careful for big returns from a guy like Ted Ginn. I think this could be a low-scoring game. It won’t be a blowout as the defense will take control over the game and it will come down to which team makes the mistakes. I think that the Panthers are the more complete team right now and they should have an edge in this game. Panthers win 21-17. This entry was posted in Carolina Panthers, Denver Broncos, NFL and tagged Super Bowl 50. Bookmark the permalink.